Rick Perry's Got Texas-Sized Money-Raising Skills : It's All Politics The Texas governor is widely expected to enter the presidential race this weekend, and once he does, the strength of his Texas-sized fundraising machine will likely reboot the race for the Republican nomination. SAN ANTONIO — When he arrived here to speak at a summit of the National Conference of State Legislatures, Texas Gov. Rick Perry found himself at the center of the kind of buzz befitting a presidential candidate. Speaking before a packed hall, Perry drove home the jobs message that is expected to be the cornerstone of his presidential bid. "We know that dollars are far more better served in the hands of the private sector than in the hands of government," Perry told the crowd of more than 1,300. While he has yet to make it official, Perry is widely expected to make clear this weekend he intends to run for president. Political watchers are expecting Perry's entrance to be an instant reboot of the Republican presidential field, largely because of Perry's unique mix of big-state job creation cred, anti-Washington fervor and a fiercely socially conservative record. But one of the biggest factors making Perry instantly credible is money. "There's been speculation about whether he can raise the money to compete nationally and that question is laughable," said Craig McDonald, head of Texans for Public Justice, an Austin-based nonprofit that tracks campaign finance. "[Perry's] the all time leading fundraiser in Texas politics. If he doesn't stumble politically out of the box, his fundraising certainly won't hold him back." And the maxim of everything being bigger in Texas certainly holds true for campaign fundraising. It costs so many millions of dollars to run statewide in a state with 22 media markets that in his most recent run for re-election, Perry raised nearly $39 million in the primary and general. That's nearly ten times as much as fellow Tea Party favorite, Nikki Haley of South Carolina, brought in to win her state's primary and general. Texas is one of only a dozen states with no limits on individual giving to statewide candidates, and Perry's been a huge beneficiary. In the past decade, more than half of the governor's fundraising totals came from just 204 mega-donors who each supplied $100,000 or more. In a federal race, he would be constrained to $2,500 per donor, per cycle (so $5,000 for both the primary and general elections), but like other presidential candidates, he could rely on fundraisers with wealthy networks who pool together the smaller donations, a process known as "bundling". "He will have one of the most impressive bundling networks in the field," said McDonald. You can also expect Perry to be the beneficiary of so-called "super" PACs, an outgrowth of the 2010 "Citizens United" Supreme Court decision. It allows for corporations, unions and individuals to give unlimited funds to outside groups to campaign for — or against — candidates. "Super PACS are perfect for Governor Perry," McDonald said. "There's a whole corporate structure that would likely line up behind the super PACs." Several groups are already competing to be the main Perry Super PAC, but a new organization announced this week has the likely edge. It's backed by Mike Toomey, who served with Perry in the Texas House in the 1980s, went on to become his chief of staff, and is currently one of the most powerful lobbyists in Austin. As the Texas Tribune reported, Toomey is heading up the "Make Us Great Again" PAC, which has emailed potential donors urging them "to avoid any other group claiming to be 'the' pro-Perry independent effort and, when the timing is right, to support 'Make Us Great Again.'" His long-standing ties to ideologically conservative, wealthy businessmen could also be a huge boost. Houston homebuilder Bob Perry (no relation) is one of the nation's most prolific Republican givers and Perry's largest individual donor. Perry (no relation) funded in large part the 2004 Swift Boat Veterans for Truth group that ran negative ads against then-Democratic presidential nominee, Sen. John Kerry. Since 2001, Perry has given $2.4 million dollars to the Texas governor. Perry's other past backers in his state-wide races have included San Antonio auto dealer Red McCombs, San Antonio physician Dr. Jim Leininger and industrialist brothers Charles and David Koch. 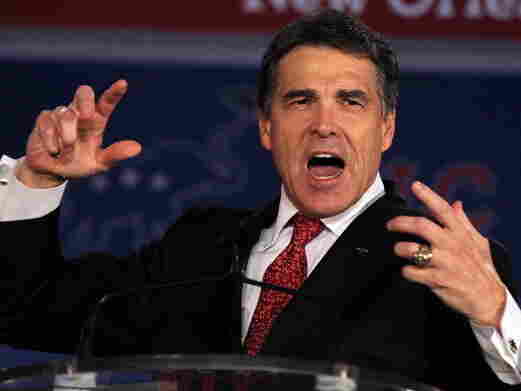 If most of those past supporters decide to back him again, that could obviously make Perry very formidable.